Lou Gossett and Richard Gere in "An Officer and a Gentleman"
Tempers under control. In the Tarot, "temperance" is not abstinence from alcohol, nor is it having a temperate nature. Temperance is a ritualized series of trials and tests that make you a stronger person, like tempering a metal weapon in fire to make it strong and hard. It is "that which does not kill you will only make you stronger." 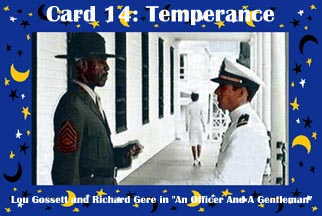 For example, drill sergeant Louis Gossett, Jr. is the "temperor", and officer candidate Richard Gere is the "temperee". Together they are Temperance. The non-com and the officer show their tempers at "An Officer and a Gentleman". Tom Cruise, Val Kilmer, Anthony Edwards, etc. in "Top Gun"
Demi Moore as "G.I. Jane"
Richard Harris as "The Man Called Horse"